Since ancient times this feast also was known as the day of illumination and the feast of lights, because God is the Light and reveals Himself to illumine "those who sat in darkness and the shadow of death" (Mt. 4:16) and to save according to grace, Who has now been revealed by the appearing of our Savior" (2 Tim. 1:9-10), and because on the Eve of Theophany it was the custom to baptize the catechumens, which actually is spiritual illumination and during which many lamps are lit. Besides this, the ancient Church on this day also remembered other events in which the divine worthiness and representation of Jesus Christ was expressed both during His birth, and during His introduction to preach in public after baptism, namely: 1) the worship of the magi as a revelation of Jesus Christ to the pagan world by means of a wonderful star;4 from this commemoration the very feast of Epiphany in the Western Church received the name of the Feast of the Three Kings (Festum trium regum); in the Eastern Church though it was part of the feast, it was not expressed in the character of the feast; 2) The manifestation of the divine power of Jesus Christ in His first miracle at the marriage in Cana of Galilee when the Lord “created the beginning of signs”; and 3) (in the African Church) the appearance of the divine power in Jesus Christ in the wonderful feeding of the more than 5000 persons by Him with five breads in the desert, from which even the feast is called the Phagiphania. The Feast of Theophany is one of the twelve major feasts. It has 4 days of Forefeast and 8 days of Afterfeast. The Leavetaking is on January 14. It is celebrated in many respects similar to the feast of the Nativity of Christ. The All-night Vigil for the feast of the Baptism always begins with the Great Compline, therefore the Great Vespers on that day is done earlier. If the feast falls on Sunday or Monday, the Liturgy is that of St. Basil the Great. If the feast falls on other days of the week, the Liturgy is that of St. John Chrysostom. In the Liturgy, instead of "the Trisagion Hymn" sing "As many as have been baptized into Christ...", in commemoration of the ancient custom to do the solemn baptism of catechumens on this feast. Instead of the "Hymn to the Theotokos" sing the Irmos of the 9th ode of the Canon. On January 6, after the Liturgy is finished, usually, at the springs, rivers and lakes, or ponds and wells, "The Order of the Great Sanctification of Holy Theophany", i.e. the great sanctification of water in commemoration of the baptism of the Lord is also done the same, as in the Compline of the feast.7 For this sanctification of water there is a solemn procession with the cross, the Gospel, lamps and banners to the water, during the ringing of the bell and while singing the Troparion: "The voice of the Lord upon the waters...", etc. The return procession is done while singing: "When Thou, O Lord, was baptized in the Jordan..."; at the very entrance of the temple we sing the Ideomelon: "Let us sing, O faithful". 1. In the past, on the shore of the Jordan, that place where, according to tradition, the Savior was baptized, there was a hermitage of the Holy Forerunner and Baptist of the Lord John. Sorrowfully, at the present time, the once glorious hermitage presents itself as a heap of sad ruins scattered on the coastal hills of the sacred river. 2. The Holy Spirit was revealed as a dove because this image most resembled both the Holy Spirit and Christ the Lord. According to the teaching of St. John Chrysostom, "the dove is a gentle and pure being and like the Holy Spirit is a spirit of meekness, that He also was revealed with the same image"; "in the form of a dove the Spirit descended as the depiction of Christ's humanity as pure, sinless and true". According to the explanation of Cyril of Jerusalem, "as then during Noah's time the dove announced the end of the flood bringing an olive branch, and now the Holy Spirit as a dove announces the remission of sins; there, an olive branch, here, the mercy of our God". Explaining the descent of the Holy Spirit, Who was before one in essence with Christ, St. Athanasius the Great says: "let anyone not understanding that Christ received, not having Him before, for He sent the Spirit from above as God, and He received Him below as man". St. John Chrysostom explains: "The Holy Spirit descended on Jesus not as if at this time it was the first time bestowed ,but to reveal the Preacher". 3. The feast is established on the 6th day of January, agreeing with tradition, according to which it says that this day was made a festal event, and also according to the witness of the Gospel, which announces that Jesus Christ on the day of His baptism, was "about 30 years of age" (Lk.3:23); therefore it follows He was baptized near the day of His Nativity. 4. Roman Catholics even now places the worship of the magi as the main object of the feast on January 6; Theophany as the baptism of the Savior is celebrated on January 13; and on the Sunday following the Baptism Theophany is celebrated in the changing of water into wine. 5. In these hymns, by the way, the tradition that Jesus Christ was baptized through immersion is clearly expressed. Thus, for example, the expressions about Him: "He is covered by the waters of the Jordan", "He is clothed with the waters of the Jordan". In the Octoechos service for Tuesday, Tone 1 Matins, the Canon directly says that John the Baptist "has plunged the head of Christ in the waters". The evangelists (Mt. 3:16, Mk. 1:10) definitely speak about "the ascent of the Savior from the water" that naturally followed the descent into the water. All this, taken together, is the precise idea that at the baptism of the Savior, all of His body and His head, went through immersion in the Jordan. 6. The people know this feast as the "Jordani" because the church processions to the rivers for the blessing of water are like going to the Jordan River. In the some places this feast is called "Vodoshchi" that is "baptized water" (vodokreshchi), from the blessing of water. According to the weather on the day of Theophany the people build conjectures about the future situation of crops and weather: if on Theophany it snows, there will be a harvest; if it is a clear day, there will be a poor harvest. If on Theophany the day is warm, the grain will be dark (thick). If on the day of the Baptism there are blue clouds at midday, there will be a harvest; if on the Baptism there is a snow storm, and on the Saint's day there is a snow storm; if the Jordan ice-hole is full of water, the overflow will be big; bitter cold foretells a bumper crop year. In some places there is a custom on this day to bathe in the rivers (they bathe in particular so that for the Saints they are disguised, their fortunes told and so forth, attributing to this bathing cleansing power from these sins). Such a custom cannot be justified as a desire to imitate the example of immersing the Savior in the water, and nor to the example of pilgrims to Palestine, bathing in the Jordan River in all seasons. In the East it is safe for pilgrims, because there is no such cold and frost there, as it is for us. 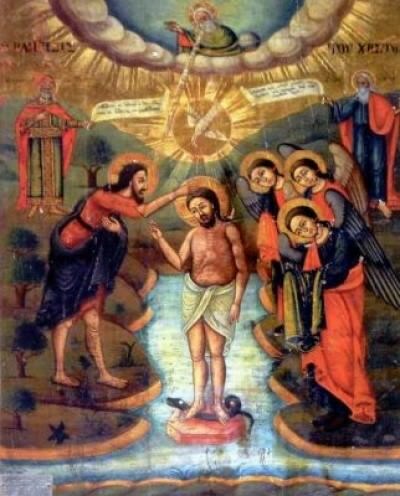 For the benefit of this custom one cannot speak with conviction on the healing and cleansing power of the water blessed by the Church on the day of the baptism of the Savior, because to bathe in winter either means to demand a miracle from God, or complete scorn for one's life and health. If one is to believe the newspaper articles that in the Sukhumi area there is a custom that the holy cross is plunged into the water during the blessing of waters, which one of the laymen present offers to take it from water as a payment to somebody (Sunday (Nedelia) 1892). In the seaside cities of the Taurian Province the custom of throwing the cross into the sea is observed among the Russian population. This custom is generally brought from Greece where there are always seekers to retrieve the thrown cross during which in a single year does not manage the act without murders and accidents (see Riazanskiia Eparchialjniia Vedomosti (Riazan Diocesan News) 1894, 5). In our Southern seacoast population this custom is brought by colonists and that after the blessing of water, a big wooden cross is thrown into the waves, for which some people even swim, sitting on their boats, hardly covered with an overcoat; then the latter quickly dives in and all wishing to get the cross quickly swim to it; after having retrieved the cross they follow him to the city, collecting gifts for the retrieval; thus, in one of the places part of money goes to the poor, a part to the parish church and a part for the benefit of the retrieved cross; in other places all the collected money of the retrieved cross is spent for a little feast. One cannot be tolerant of and should destroy these customs in themselves and those that similarly describe customs breaking the sacredness of the observed celebrations and contradicting the spirit of true Christianity. 7. The rite of the Great Blessing of Water arose from the custom to baptize Catechumens on the Eve of Theophany. The prayers of the Theophany Sanctification of Water are taken from the rite of Baptism and there is no other, as the latest of its processing. 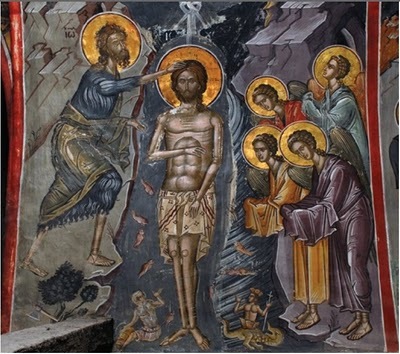 Therefore the oldest known date for the rite of the Theophany blessing of water is for the evening and night on the eve of this feast, instead of on the day of Theophany. This custom of the one time blessing of water on the eve of Theophany was kept up until the XI-XII century and, then, under the influence of the Jerusalem Typicon (Ustav), conceded to the two times blessing of water, in which the blessing of water was done on both the eve and on the day of Theophany. The latter custom, gradually strengthening, eventually received positive meaning in the Greek Typicon of the Jerusalem branch and in its service books from the same source. In the Slavonic Typicons (Ustavi) of the Jerusalem edition it speaks about the two, and then about the one blessing of water. Maximus the Greek who lived on Mount Athos bore witness that during his time in the East and, often, on Mount Athos there was the custom of the two blessings of water and there even was written a special letter for the protection of this custom. The question on this custom was posed by Arsenius Sukhanov (made on his 1651-1652 travel to the East) for a decision by the patriarch, and was solved positively. (See the details in The Church Typicon (Ustav), J. Mansvetov, pp. 156 - 9). Patriarch Nikon, entered into the error of one Greek book (where he found evidence of Evodus, Patriarch of Constantinople, that the blessing of water on Theophany should be done only once, and in the Compline of the feast, and not in church, but at the river), not seeing that until then both among us and in the East there was the custom to bless the waters twice (in Compline in the church and on the day of the feast at the river), and also not at all seeing the conviction of the Antiochian Patriarch Macarius not to back off from this custom, decided to back off, and at a little council called by him in 1655, it was postulated: "On the day of Theophany do not proceed to the baptismal font and do not do the blessing of water". (History of the Russian Church by Macarius, Metropolitan of Moscow, volume XII, pp.199-200). But the Great Moscow Council of 1666-1667 decided: "By command and an oath, which Nikon, who was the Patriarch, injudiciously laid down to do the blessing of waters on Holy Theophany one time, only in Compline, we resolve and we remand and we impute it as nothing. We rule and bless to do according to the ancient custom of the Holy Eastern Churches and according to the tradition of the Holy and God-bearing Fathers: to do the blessing of holy waters in Compline in the churches, and after Matins at the river, for all church typicons also say prayers and do the action" (Materials for the History of the Schism (Raskol), vol. 2, part 2, pages 237-8; refer to page 362 in the same place). In past times in our printed typicons (for example 1695, 1733, 1791) a special article about the two great blessings of water was located. A publication of the Synodal printing house in 1795 "the Order of the Church Servers and Rites, observed in the Great Dormition Cathedral" (in Moscow), orders the bishops to do the great blessing of water twice: in Compline and on the day of Theophany; thus it speaks of the time of the fulfillment of the blessing of water: "in the year 190 (i.e. 1681) the great Lord, the Most Holy Joachim, Patriarch of Moscow and all Russia specified this action to take place after the liturgy, but the liturgy is served early, having counseled with his sons, with the most reverend metropolitans, archbishops and bishops" (page 5). 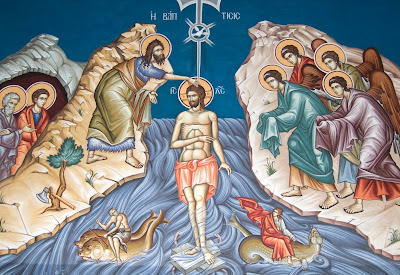 The contemporary Typicon, ordering to do the great blessing of water on the eve of Theophany, passes in silence about doing this blessing of water on the day of Theophany. As if the existing church practice everywhere in the cities, on January 6, after the liturgy, from the cathedral temples, with the participation of city parish clergy, we have a solemn cross procession to the so-called "Jordan", arranged,ordinarily, at the river, for the fulfillment there of the great blessing of water. Also in the villages as far as it is known to us, at the appointed time there is a cross procession to the river, and other water reservoirs, for the fulfillment there of the great blessing of water. If there is no cross procession to the river or other water reservoirs where these water places are situated too far from the parish temple; but all in all even in such districts, ordinarily, near the temple the great blessing of water is done also in deliberately prepared vats or tubs. However, perhaps, where at the appointed time they do not do the blessing of water at all, or instead of the great they do the lesser blessing of water. But this is wrong, because, according to the above-stated data, on the day of Theophany, as well as in the Compline of this feast, one must do the Great Blessing of Water.